Just a 5-minute drive from Rotorua city centre, Lake Rotorua Hotel features an outdoor heated swimming pool. Each room includes heating and access to free WiFi and free parking. 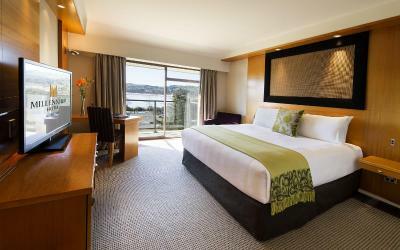 Opened in November 2012, Quest Rotorua Central is 550 metres from the Polynesian Spa and 1 km from the lake front. It offers self-contained accommodation with a fully equipped kitchen and laundry facilities. Guests enjoy free WiFi. Located opposite the Rotorua Golf Course, SilverOaks Hotel offers stunning views over the Pohutu Geyser and Thermal Wonderland. It boasts an outdoor pool, a fitness centre, a sauna and a spa pool. Located midway between downtown Roturua and the Whakerewarewa thermal area, the Silver Oaks Resort Heritage is a resort-style hotel offering spacious accommodation and a great range of facilities.